Dassault Mirage IIIc - Escadrille 1/2 “Cicognes” (Storks), Armee de l'Air, 1964. Dassault's sleek and modern Mirage IIIc first flew in 1960, yet remained in front-line service with the French Air Force in Africa until 1988. It wasn't without its problems; the delta wing configuration required very long and fast take-off and landing runs and severely limited the Mirage's turning ability during a dogfight, whilst the first combat experience with the Israeli Air Force highlighted several issues, such as gas ingestion from the cannons into the engine, causing dangerous flame-outs during combat. Nevertheless, the early Mirage remains a classic piece of aviation engineering and an outstandingly successful design, whose influence can be traced through all of the Mirage Family and on to the latest Rafale fighter. Esc. 1/2 Cicognes (Storks) is one of the most distinguished French Air Force Squadrons, tracing its history from WW1, when it was formed from the flights that included the famous French aces Guynemer and Fonck, through the Battle of France. As part of the Free French forces (329 Sqn RAF) it played a key part in the Normandy Landings. Later, reformed as 1/2, it would fight in French Indo-China (Vietnam), and alongside the British once more during the Suez crisis. In 1961 it became the first operational squadron to fly the Mirage III. Dassault Mirage III O - 3 Squadron, RAAF Butterworth, Malaysia, 1972. In the early 1960s, Australia chose to build the multi-role Mirage IIIE under licence. Aircraft were built at the Government Aircraft Factory in Melbourne, along with licence built SNECMA Atar engines produced by the Commonwealth Aircraft Corporation (after a brief flirtation with the idea of a Rolls Royce Avon powered Mirage. An Australian-specified avionics suite was also fitted. Two variants were built, one optimised for air to air combat and one for ground attack and a total of 100 were produced. Australian Mirages remained in service until 1988, and were then sold on to the Pakistan Air Force. French Air Force "Force de Frappe"
Produced as a direct result of the Suez debacle; French dismay at the US' failure to support its 3 key allies (UK/France/Israel) at Suez led to withdrawal from NATO's military structure and a determination to develop their own independent strategic nuclear weapons, so that they were no longer dependant on the US "Nuclear Umbrella". The French "triad" included silo launched missiles on the Plateau d'Albion, submarine launched missiles and air launched AN-11/22 gravity bombs (later replaced by stand-off missiles) carried by 62 Mirage IV aircraft in 9 Squadrons. Toward the end of its life, the Mirage IV was converted for reconnaissance duties, seeing active duty during the Kosovo conflict. ... did you know? Marcel Dassault, the founder of Avions Marcel Dassault (AMD), was born Marcel Bloch and many early French warplanes carry his true name. Bloch was Jewish, and was imprisoned by the Nazis in Buchenwald concentration camp for refusing to work for the Nazi aviation industry. After the war he changed his name from Bloch to Dassault, in honour of his brother Darius Bloch, a leading member of the Free French Resistance, whose secret code name was "char d'assault" (the French for "tank"). Mirage 2000D - Adl'A Demonstrator, 1994. The Mirage 2000 was a private Dassault venture to fill the gap caused by delays in the Rafale programme. Although evolved from the Mirage III/5, it was an entirely new aircraft, featuring inherent instability (and thus maneoverability), plus fly by wire control. The initial 2000s were single seat fighters, but the 2 seat 2000C trainer was developed into the 2000N Nuclear Bomber as a replacement for the Mirage IV. The 2000D ("Diverse") was a further ground attack evolution of the 2000N as a Jaguar replacement, in a similar class to the UK/German/Italian/Saudi Tornado GR1/IDS. French Air Force Mirage 2000Ds, operating under UN Mandate, provided support to RN forces in the Adriatic (Op SHARP GUARD) and the Gulf (Op Southern Watch 1994-2002) as well as playing a major part in the NATO Kosovo intervention. Dassault Mirage 2000C - Escadron de Chasse 1/5 “Vendee”, Armee de l'Air, 1989. The "C", or Chasse (fighter) version of the Mirage 2000 has been a core part of the French Air Defences since the late 1980s. Its sleek and blended shape is still recognisably derived from the early Mirage III, but with a more modern and aggressive stance. Armed with 2x30mm cannon, MBDA Super 530 BVR air-to-air missiles and the R550 Magic (sidewinder equivalents), some 50 years after it first flew, the evolved Mirage weapons platform remains a potent combat capability, in the same class as the F-16. Mirage 2000c aircraft from EC. 1/5 participated in Operation Daguet, the First Gulf War in 1990/91 and during the Bosnian war of the mid 1990s. They also starred in the film Chevaliers du Ciel (Knights of the Sky). The squadron was dissolved in 2007 and its aircraft sold to Brasil. The Rafale (Squall) is effectively the French equivalent of the Eurofighter Typhoon, and indeed grew from the same original requirement. One significant difference from the Typhoon is the existence of a carrier borne variant, the Rafale M (Maritime), which serves aboard the French Navy aircraft carrier, FS Charles de Gaulle, entering service in 2004. French Navy Rafales deployed to Afghanistan in 2006 as part of NATO operations and are currently operating over Syria against ISIL. Dassault Rafale B, CEAM/EC 5/330 (Trials & Assessment), NATO Tiger Meet 2008, BAN Landivisiau. HobbyBoss have produced a superb kit of the Rafale B in 1/72, which comes with a choice of two different stunning Tiger Meet markings. The two-seat Rafale was orignially intended as a trainer, but the French Air Force have detemrined that the second seat is essential for effective ground attack operations and have revised the balance of their order so that most operational land-based French Rafales will be the B model. This stunning scheme was prepared for the "Ocean Tiger" NATO Tiger Meet gathering at the French Navy Air Base Landivisiau in 2008. Dassault Rafale C, EC 1/7 “Provence”, Saint Dizier-Robinson Air Base, 2010. Flottille 17F, Marine Nationale, BAN Hyeres, 1991. The Etendard started life as Dassault’s proposal for the 1950s NATO NBMR1 competition that was intended to equip NATO air arms with a common lightweight fighter (partly inspired by Folland’s Gnat and eventually filled by the Fiat G-91 ). 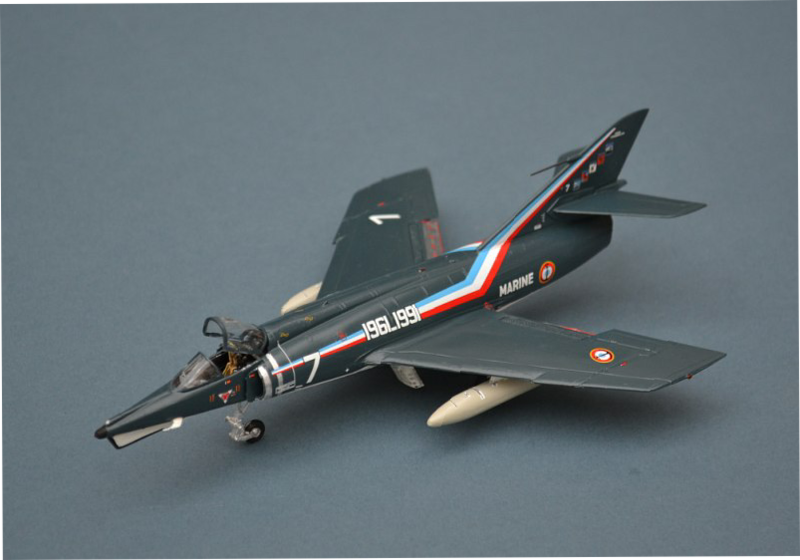 Although the Etendard was unsuccessful, an enlarged version was quickly adopted by the French Navy, with the navalised variant featuring a tail hook, taller undercarriage and folding wings and making its first flight in 1956. The French Navy ordered 90 aircraft, mostly IVM fighters, but also including 20 IVP reconnaissance variants, all for service onboard the new Clemenceau and Foch aircraft carriers starting in 1961 . Etendards IVMs were superceded by the radar equipped Super Etendard in the mid 1970s, but despite their relative simplicity and limited capabilities, they remained in second line service ashore at Hyeres until 1991, with the subject of this model being painted in a special commemorative scheme to mark their retirement after 30 years of service. Etendard IVPs remained in front line service until 2000.